IPSWICH residents angry over a proposal to establish a new dump in what will be one of Australia's largest landfills should expect more, similar proposals. On Saturday, residents met with Ipswich City Council mayor Andrew Antoniolli, Bundamba MP Jo-Ann Miller and councillors Kerry Silver and David Morrison over waste giant BMI's plans for a new landfill at New Chum. 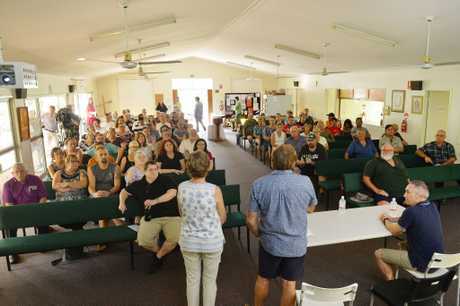 The meeting went for three hours and covered the state of Ipswich's landfill industry, including concerns over dust at Cleanaway's existing New Chum dump. Mayor Andrew Antoniolli told the crowd of about 60 people that more applications were likely from other waste operators. He said Ipswich's past as a mining town had made the city attractive to companies looking for landfill sites with disused mining voids presenting the perfect opportunity. "Council expects more applications to follow," he said. "This is going to be a long battle." Bundamba MP Jo-Ann Miller left no doubt in anyone's mind on her position regarding the new proposal brought to the old mine site. BMI has proposed to establish a new landfill facility at New Chum. The company plans to use demolition and construction waste, including waste brought in from New South Wales, to fill a disused mining void. The landfill would take 15.7 million cubic metres of waste over 18 years. 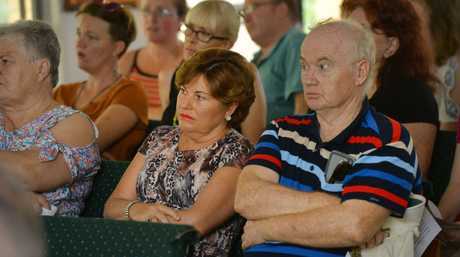 The crowd cheered as Ms Miller said she would strongly oppose the proposal, on behalf of her community, and any other future application to establish a new landfill within the Ipswich City area. "I don't want the dump and I thought it was important I make that very clear to our local community," Ms Miller said. Ms Miller has previously referred to the controversial proposal as "Ipswich's Adani". One woman referred to the application from BMI as "the coming of the Grimm Reaper" - she blamed the council for material published in 2012 stating "we welcome waste". Collingwood Park mum Laurie Gray said she feared for the health of her two young children. "I have concerns over asbestos and air quality," Ms Gray said. "There seems to be a lot of buck passing... why can't they (the State Government Environment Department and the council) just work together? "And if it is the Environment Department that's not doing its job then why can't (the council) embarrass them - get to the media - I mean just get it done. "This has been five years and there's still nothing been done about the (Cleanaway) dump and now they're talking about another one? "I don't want my kids dying in 30 years from asbestosis." Collingwood Park mum Laurie Gray: Collingwood Park mum Laurie Gray talks about her fears regarding Ipswich's dumps. Steven Cantle questioned the council on why it wasn't enforcing its own rules. When he arrived at the meeting, he didn't even realise it was about an application being lodged for a new dump. "I asked what is the council doing to protect us in regards to air quality?" Mr Cantle asked. "Why aren't the trucks going up and down the Ipswich Motorway covered when they're carrying unprocessed building materials? There could be anything in it." Ipswich father Steven Cantle : Ipswich father Steven Cantle questioned the council on why it wasn't enforcing its own rules. Mr Cantle can see the New Chum facility from his house and regularly watches dust rising from the facility. He too has young children and fears for their health. Cr Antoniolli said he would speak with his colleagues on Monday about upping the scrutiny on waste operators. "We will be discussing with the State Government the option of partnering to double our efforts on compliance," Cr Antoniolli said. "Like many people, I am not comfortable with the dumps." He said residents needed to make submissions to the council when the consultation period opened. "There's a difference between being loud about not wanting a development to go ahead and actually taking the time to lodge a submission against it. "I would ask all residents to make a submission when the time comes." During the meeting Cr Antoniolli hesitated to say he opposed BMI's proposal repeating previous statements that there was a legal process to be followed. A member of the council's planning team also attended the meeting to offer residents some insight into that process. "I have written to the State Government to ask them to 'call in' the application of Bio-Recycle appeal (which has been lodged in the Planning and Environment Court after the council rejected the proposal)," Cr Antoniolli said. To 'call in' an application would mean the State Government would decide whether or not the development was approved. Cr David Pahlke has publicly said he wants the State Government to 'call in' the BMI application- a measure reserved for developments where the State Government has a significant interest. A statement from BMI answering basic questions on the proposal can also be found further down in this story. TODAY concerned residents have filed into a church at Collingwood Park to discuss the proposed new 'super dump' for Ipswich. Ipswich mayor Andrew Antoniolli, Bundamba MP Jo-Ann Miller, former candidate for the seat of Ipswich One Nation member Malcolm Roberts and councillor David Morrison have arrived, along with a host of residents. Waste giant BMI has proposed to establish a new landfill facility at New Chum. BMI has confirmed waste -would be brought in from New South Wales and other southeast Queensland sites. The application was officially lodged by Austin BMI Pty Ltd as the Ipswich Resource Recovery Facility. Ipswich City Council has not made a decision on the application yet. The landfill would take 15.7 million cubic metres of waste over 18 years OR 1.1 million tonnes of rubbish each year. The application for a new dump has made national headlines and brought the spotlight back to Ipswich and its massive landfill operations. An investigation by Fairfax media found thousands of tonnes of New South Wales waste sent each week to south-east Queensland to be recycled is trucked straight to landfill without any processing. Below is the most comprehensive statement the QT has received from BMI regarding the proposal. The QT has asked questions of the company on several occasions. Austin BMI Pty Ltd proposes to establish the Ipswich Resource Recovery Facility at 191 Whitwood Road Swanbank in the New Chum Enterprise Area. The development will repurpose an abandoned mine, facilitating its progressive rehabilitation with the establishment of a construction and demolition (C&D) waste management and landfill facility. The proposed development's airspace capacity - approximately 15.7 million cubic metres. Based on assumed waste acceptance rates, the landfill is expected to have an operating life of approximately 18 years. Austin BMI Pty Ltd has lodged a development application (DA) with Ipswich City Council. 1. Where is the development proposed? 191 Whitwood Road Swanbank - the former New Hope Coal mine in the New Chum Enterprise Area. QT NOTE: New Hope has reached out to the QT to say this specific void is not one of its former sites. The site has been extensively subject to, and impacted by, underground and open cut mining activities. Most underground mining was in the eastern parts of the site, with open cut mining under the central and eastern parts. The site's key feature is a large, unmanaged and dangerous void created as a result of historic open cut mining activities. 3. Is this an extension of the existing Cleanaway site? No. The Whitwood Road site is privately and wholly owned by the BMI Group subsidiary, Austin BMI Pty Ltd.
BMI Group is a group of family businesses. The site is separate from, and in no way associated with, the Cleanaway site. While the title lists the address as Whitwood Road, all incoming material will be received through the site entrance on Austin Street. 4. What types of waste will the facility receive? Only dry construction and demolition waste, commercial and industrial waste and low-level contaminated soils. Unlike some landfills, the facility will not receive asbestos or putrescible domestic waste that causes odour. C&D waste is generally sourced from demolished buildings, renovated houses, refurbished buildings and construction sites. QT NOTE: The application documents lodged with the council state 10% of the total waste received over the facility's lifetime would be regulated waste, which may include asbestos. 5. Will waste be received from NSW? Yes. Waste arrives from local Ipswich sites, southeast Queensland and NSW. This waste is generated by industry demolishing, constructing, refurbishing and renovating buildings. It is lawful for Queensland facilities to receive waste from NSW. QT NOTE: The State Government is reviewing the interstate waste industry including considering reintroducing a waste levy. 6. Is any of the waste recycled or is it all used as landfill? Recycling is optimised at BMI facilities. Only low-level contaminated soils and dry construction, demolition, commercial and industrial waste will be deposited directly to the mining void as landfill. After onsite sorting, recyclables (some concrete and metals) will be transferred offsite and converted into reusable materials. Non-recyclables not for our landfill will be transported to nearby licenced landfill sites. QT NOTE: An investigation by Fairfax media challenges this statement. 7. BMI has a waste facility at Bogside. What does it do there? A BMI Group company, Bogside Mining Industries owns and operates the Bogside resource recovery facility at Swanbank. It is one of Ipswich's abandoned coal mine voids, left open, unsafe and without rehabilitation since around the 1980s by the mine operator. BMI is rehabilitating the old mine site at Bogside, working to reinstate the natural landform. Bogside accepts clean fill, green waste, mulch and soils. Other waste products delivered to the site are sorted, stored and then transferred to local landfill sites operated by Cleanaway and Greenspot. 8. Why can't the Bogside facility accept the waste instead of creating a second site? The Bogside facility is being rehabilitated for an eventual landuse as a mix of ecological corridor and future industry, as per the current Ipswich planning scheme. Due to the coal fires which remain following the cessation of coal mining, the site is not suited to the establishment of a landfill. 9. There is a big pile of rubbish at the Bogside site. What is this and why is it there? This pile is the result of a shortage of trucks able to take residual waste out of the Bogside site over the past few months. This shortage has now been overcome and the pile is being decreased by us significantly week to week. 10. What about the complaints lodged about Bogside? Bogside Mining Industries has operated on the site for nearly 10 years, during which we have engaged with the Department of Environment and Heritage, in its role as the regulator. The department did conduct site investigations following the complaints. As with all site audits, the department will follow up with an audit response. This identifies any aspects of the operation on which the department requests responses on BMI's compliance with existing licence conditions. To date, we have received no written communication about the audit from the department. 11. Some claim the new facility will cause nuisance for local residents. Dust and water pollution are concerns. How do you respond to this? Dust BMI's Bogside site operates a water truck, spraying approximately 300,000 litres of water on to site roads and stockpiles each working day. This dust suppression measure will be replicated at the new site, in line with best practice. Water quality Water will be pumped from the mining void in a controlled manner. Once treated to an acceptable quality, water will be pumped through a series of in-line 'real time' test probes that ensure stringent criteria are met. Any test result not in accordance with water quality criteria will shut the system down. It can only be re-started when water quality within specification is attained. This system ensures that only clean water is released to Six Mile Creek. 12. Will the new site increase the risk of fires? No. Properly compacted construction and demolition waste is a very low fire hazard. The BMI operation will be licenced, with conditions requiring the daily covering of waste with soil to control the potential for fires and also vermin and windblown litter. 13. Will this create new jobs or will staff just be transferred from Bogside? New jobs will be created, adding to BMI's current workforce of 85 personnel. The development of a new facility will drive supplier and contractor opportunities. 14. How will local traffic be affected? It is anticipated that delivery and off-site transport of waste will necessitate multiple truck movements per day. Some of these daily loads will be diverted from alternative resource recovery operations, and would therefore already have been travelling on the local network. 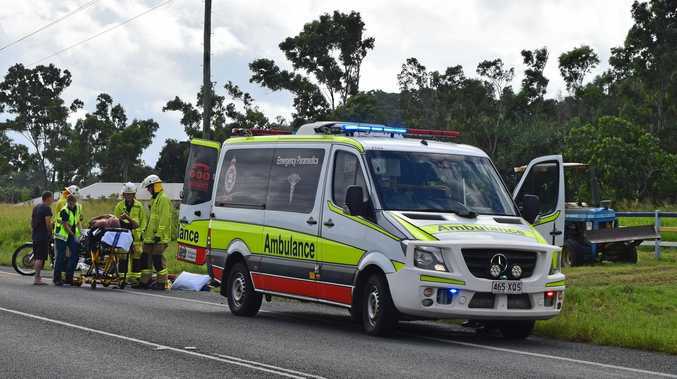 Trucks will predominantly use the Cunningham Highway, with no need to travel on local roads or near residential areas. For more information or to book a meeting, you can get in touch with CPR Group. They are the communicators on our project team and they're meeting with interested locals about the project.